Gunflint & Lake Superior RR | Poverty, Agony, Distress & Want! 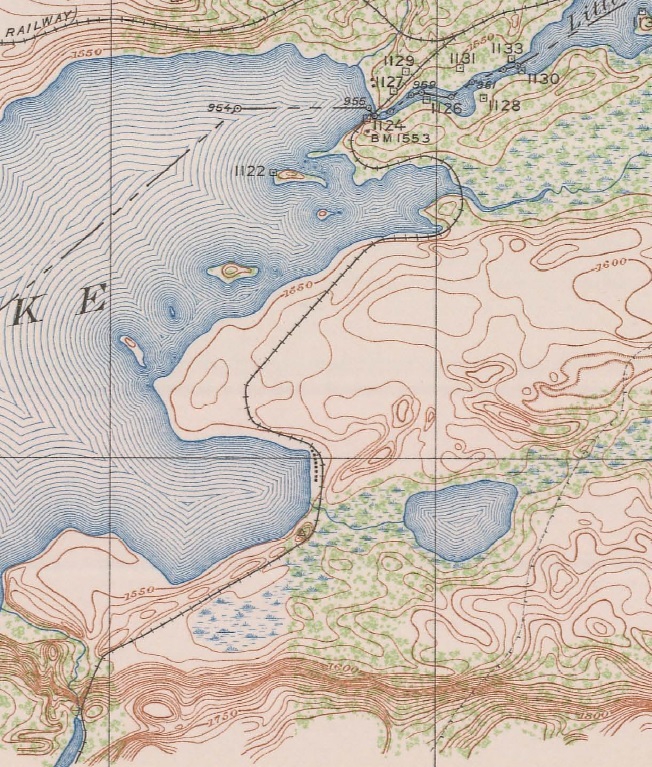 This 1929 International Boundary Commission map (surveyed 1911) shows the the route of the G & LS from the branch with the Duluth Extension to the Crab River. The site of Camp 4 is also visible. In the fall and winter of 1902, the Pigeon River Lumber Company built the Gunflint and Lake Superior Railroad (G&LS). It connected to the Duluth Extension of the Canadian Northern Railway (PAD&W) at Milepost 79. The company located their principal camp, Number 4, beside a bay at the eastern end of the lake. By the end of the first season, they had shipped some 800 cars of logs to their mill in Port Arthur. To collect duties on the imported logs, both governments established customs houses alongside the railway. In March 1903, the PRLC officially incorporated the line under the name “Gunflint & Lake Superior Railroad.” It was chartered to build from the Canada-US border southeasterly to Lake Superior at or near Grand Marais, MN. Later that year, frustrated by the lack of motive power provided by CNoR the previous season, the G&LS purchased their own 4-4-0 locomotive to haul their cuts to the railway terminus at North Lake. Work began extending the line from Camp 4 southwesterly then southerly toward Crab Lake. This involved some rock work and the construction of a large wood and earthen embankment to climb the ridge south of Gunflint Lake (click here to view a video of the trestle). In 1905, they acquired a second engine, a Lima Shay locomotive specifically designed to work on logging lines. Over the next several years, the Company’s operations would expand to see almost 200 men employed during the winter months at Gunflint. The line was further extended, reaching Crab Lake and then turning eastward to Whisker Lake and beyond. In the fall of 1906, a second logging camp, Camp 8, was established along the line (it was likely renumbered Camp 11). The 1906-1908 seasons were the best for the operation, at times accounting for more than 50 percent of the company’s timber cut. By 1909, operations were winding down however, and that year would mark the last season for the Gunflint camps. With almost all the profitable timber in the area harvested, the Pigeon River Lumber Company closed their operation, leaving all rails and buildings behind. In June, a large forest fire swept across the area and destroyed the one thousand-foot trestle along the PAD&W at North Lake, effectively severing all connection with Gunflint Lake. Time has taken its toll, removing most traces of the railway, with the exception of a few rails. Nature has even claimed the mighty log trestle, which was used by the railroad to climb the ridge south of the lake. In 2007 the area was burned by the Ham Lake Fire, igniting a smoldering blaze inside the corduroyed logs. In March 2008, the US Forest Service was forced to dynamite the trestle to extinguish the fire. G&LS #1, October 1903 (CNWHS Archives). Ex-G&LS #2, 1922 (B. Westhouse). Close-up of Canadian and US customs houses. US Customs House, circa 1919-1920 (G. Shiras III). G&LS International Crossing, August 1997. G&LS International Crossing, May 2016. G&LS Rock Cut, August 1997. Metal objects, Camp 4, October 2016. Shay 683 rear line shaft, Gunflint Lake, July 2000. Cutting, Gunflint Lake, October 2014. Rails, Gunflint Lake, October 2014. G&LS rock cut, October 2015. Grade, Whisker Lake, May 2017. Grade, Topper Lake, May 2018. Building foundation, Camp 8, May 2017. Outhouse, Camp 8 PRLC, May 2018. Snuff jar, Camp 8, May 2017.